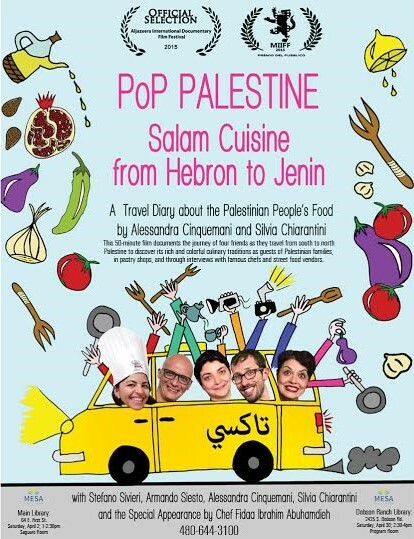 Mesa Library is presenting “PoP Palestine Cuisine,” which covers Salam cuisine from Hebron to Jenin. This 50-minute film documents the journey of four friends as they travel from south to north Palestine to discover its rich and colorful culinary traditions. They visit with Palestinian families, in pastry shops, and through interviews with famous chefs and street food vendors. Sat., April 2 from 1 p.m. – 2:30 p.m. in the Saguaro Room at Mesa Main Library, 64 E. First St. Sat., April 30 from 2:30 p.m. – 4:00 p.m. in the Program Room at Dobson Ranch Library, 2425 S. Dobson Road. Snacks will be provided. For more information visit: www.MesaLibrary.org and click on the Events Calendar.